"Something needs to be done to protect athletes. When you don't think you've done something, it's incredible to think that you could go through the process and lose your whole career over it." - Michele Verroken, the former head of anti-doping in Britain, takling about 22-year-old British hurdler Callum Priestley, who got violently sick - possibly due to contaminated beef poisoning - and then tested positive for steroids. Verroken thinks Priestley was innocent, but he's quit the sport and moved on, but his parents still fight to clear his name. If I can 100 mpw without getting injured, is there any reason not to? PLEASE HELP ME PEAK FOR STATE?! Malmo?..ANYONE?! Does the average guy have a chance? LRC Week That Was: Kisorio's Marathon Debut, Age Cheating, Marion Jones And More We go around the world to tell you what happened in the running world. And we take a look at Matthew Kisorio's marathon debut in NYC. Athens Marathon Gold Medallist Mizuki Noguchi's Comeback Gets Big Boost As She Sets New Ekiden Stage Record Last year, Noguchi ran two races but ended up with a stress fracture - but she looks great now and is just 33. Scottish Teen Guy Learmonth - "The best middle distance runner since Coe" - Is Happy To Be Back Traiing After Serious Car Crash He ran 1:48 indoors this year as an 18-year-old. Martyn Rooney Hoping To Rebound From Subpar 2011 That Resulted From Him Focusing On His Speed Rooney was 6th in Beijing but didn't make the Daegu final. Commonwealth Games Marathon Champion Irene Jerotich Will Run She's a two-time champ in Nairobi as well. Marta Dominguez To Run Road Race This Weekend In Her First Race Since Operation Galgo, Childbirth She was the steeplechase champ in 2009. If He Can Run Faster, Drug Cheat Rashid Ramzi Will Compete In London Maybe he's running slower since he's no longer on the sauce. Digicell Contest Winners In Jamaica Winner Dinner With Usain Bolt At His Restaurant Tracks And Records We had no idea Bolt had a restaurant but wish it had a better name. Guinness Won't Record 100-Year-Old's Marathon As Oldest-Ever World Record As He Can't Produce A Birth Certificate His passport and a letter from the Indian govt. saying there were not birth certificates in 1911 won't suffice. And yet nearly every week, a new teen Kenyan emerges. From Humble Beginnings, Steepler Travis Mahoney Is Now An Olympic Hopeful The Temple star, who admits he was very "immature" in HS, can't believe it but it's true and he is redshirting to focus on an Olympic bid. Recommended Read: Olympic 200m Silver Medallist Darren Campbell Tells How He Was Repeatedly Offered Drugs But Always Turned It Down The guy actually quit the sport as a youngster as he didn't want to dope. A MUST read. *MB: Kara Goucher Joins Schumacher's Group The rumors of the Skecher's deal appear to have been incorrect. Matt Centrowitz's Sister Lauren Centrowitz Wins Mayor's Cup www.baa.org Princeton alum David Nightingale won the men's race for New York Athletic Club in 23:46.
Who Really Has The Best NCAA Cross-Country Team Of All Time? Statistical math formula calculates point totals based on teams' performances at NCAA Champs each year. Top 5 teams based on this are Wisconsin, Arkansas, Colorado, Providence, and Oregon. Spanish Prince Gives Haile G "Equivalent Of The Nobel Prize For The Spanish Speaking Countries" Haile gets it for "for his sporting and human excellence." 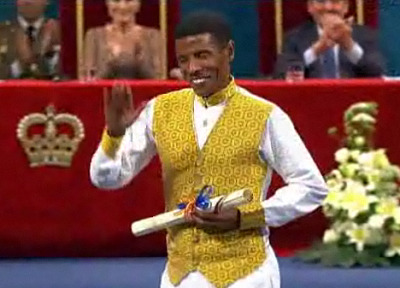 *MB: Haile G Receives Big Award - What Do You Think Of His Outfit? Why Do People Hate Ryan Hall Tim Tebow? If you think the openness of their faith doesn't have a lot to do with it, then you aren't very smart. Usain Colt Wins In England The big, leggy colt impressed. Want To Have Cocktails With Ryan And Sara Hall? Bid On The Items In The NYRR Fall Auction The cocktails will cost you $1,450. 43 Years Ago From Tuesday, Bob Beamon Broke The Long Jump World Record By More Than 2 Feet Interesting to note that he reveals he was initially excited not because he knew it was a monster jump, but rather simply because he hadn't fouled. Marion Jones To Represent The US State Department Abroad Respected Olympic writer Alan Abrahmson said it best: "Marion Jones is a liar." She apparently continues to manipulate us all if the State Department somehow thought she was what's best about America. Jamaican Journalist Writes About His Struggles With Altitude He left his jacket in the press box and ran back to get it and thought he was having a heart attack. Tuesday: Lerone Clarke's 10.01 Beats Kim Collins (10.04) At Pan Am Games 100m Final Clarke won the Commonwealth Games last year. Results only. Video of race on right or here. IAAF Day 3 Recap Rosangela Santos of Brazil won the women's 100 as Cuba's Adriana Munoz won a tactical women's 100. Jamaica: Leron Clarke Adds Pan Am 100m Crown To His Resume After Winning Commonwealths Last Year Jamaica's Maurice Smith (8214) was unable to retain his decathlon crown as WC bronze medallist Leonel Suarez of Cuba got the win (8373). Monday: IAAF Day 2 Recap Cuban Yarisley Silva upsets world champ Fabiana Murer in women's pole vault. Day 2 USA: 3 Field Event Medals As Brad Brandon Bethke (14:17.31) & Stephen Furst (14:21.94) Finsh Out Of Medals In 5,000 5th and 9th in the heat and altitude of Guadalajara. Day 1 USA: Camille Herron (2:51:29) Finishes 9th In The Women's Marathon Nothing like running a marathon at altitude (5,200 feet) and in heat. Adriana Aparecida Da Silva Wins Pan Am Games Women's Marathon She won in 2:36:37 at elevation in hot/sunny conditions. Sympathy For British Hurdler, Who Quit Sport Saying He Must Have Eaten Contaminated Meat In South Africa, Rises 22-year-old Callum Priestley has moved on to a construction job, but his parents are still trying to clear his name. Geoffrey Mutai Is Focused On Winning On New York - Not Letting Tight $500,000 WMM Race Distract Him "I am at peace with myself. All I want is to do well in New York. The other pieces will fall in place by themselves. UTEP's Blessing Okagbare Is Sad To Be Leaving El Paso To Join John Smith's Group At Nike's Request In LA The Olympic bronze medallist in the LJ ended her career as the NCAA 100m champ. 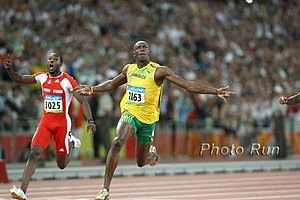 Jamaican Journalists & Coaches Debate Whether Sprinters Are Born Or Made One man gives credit to something unique with the genes of the "Afrocentric stock." Yokohama - 1st Of 3 Japanese Olympic Qualifying Races - Will Take Place On Nov. 20th The field is being finalized and includes foreigners Mara Yamauchi (GBR) and Salina Kosgei (KEN). Gérman Silva Named As Winner Of Abebe Bikila Award For Giving Back To His Community Through His Running The NYRR will honor him next weekend during its opening ceremony. "Occupy Eugene" Protesters May Make Statement At Olympic Trials One protester seemingly wants the Trials cancelled: "One Olympic Track meet ticket would feed a lot of homeless camped out here." LRC's response: "One Olympic Trials brings in a ton of cash/jobs for Eugene." 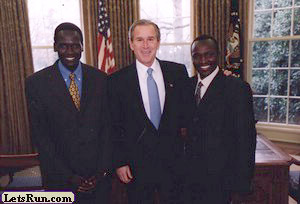 Geoffrey Mutai Has Gone From Poverty And A Job As A Lumberjack To A Rich Man And NYC Favorite New York will be a great one with 2:03 marathoner Mutai racing. Plus, there will be an exclusive LRC Puma party with free booze. Stay tuned for more details or email us if you want to come. Haile G Bounces Back To Win Birmingham Half Marathon In 61:29 UK's Gemma Steel won the women's race in 1:12:21. Lance Armstrong Crashes His Bike And Hits Head, Fading From 2nd To 23rd At XTERRA World Triathlon Champs Austria's Michael Weiss won. IAAF: Helena Kirop Smashes Venice Marathon CR With 2:23:37 Ethiopia's Tadese Aredo won the men's race in 2:09:13, just 5 seconds in front of Kenya's Simon Mukun. IAAF: World Youth Medallists Excel At Chinese City Games World Youth Champ Lin Qing won LJ with 7.95m. Recommended Read: UK's Olympic 200m Silver Medalist (4 X 1 Gold Medalist) Darren Campbell Talks About Being Offered Drugs During His Career And His Ill Feelings Towards Dwain Chambers Like us, he supports lifetime bans, but thinks Chambers should be allowed to race Olympics. He says, "At what point does the sport decide enough is enough? People are still saying, 'should it be a life ban, should it be two years?' For me, it's got to be life. You can't rob the sport, then come back to the sport, that don't make sense." Want To Use The Internet At The London Games? It'll Cost You $150 A Month The media are pretty angry about this. Meet Notre Dame's And New Mexico's 1st Sub-4 Miler, Chuck Aragon Amazingly, Chuck, who broke 4 within 6 weeks of moving to the mile, still has the ND 1,500 record from the 1970s. His daughter Alexa runs for the Irish currently. Runners Tribe Interviews Coach/Agent Nic Bideau, Who Has 9 Athletes With A Qualifiers Nic rips the IAAF for not the new women's world record and Athletics Australia for not sending B qualifiers to Daegu. An Interesting Debate: Appearance Fees Vs. Prize Money David Powell: "There may be some Utopian merit in the idea of dispensing with appearance fees and moving all the cash into prize money, but it's a fantasy notion. It's never going to happen as a rule of law. That may be stating the obvious but it needs to be said as a precursor to discussing the benefits, or otherwise, of theoretically eliminating fees." 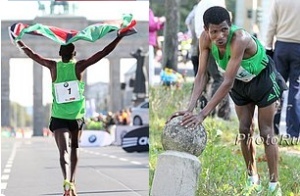 NEW YORK CITY MARATHON FINALIZES ELITE FIELD World Champs bronze medalist Feyisa Lelisa, two-time European Champs medalist Inga Abitova and the third-fastest half marathoner of all time, Mathew Kisorio (debut), have been added to the field. Lauren Fleshman: "When you've never done a marathon, it is scary as s%#!" LRC Weeks That Were: Ryan Hall Criticism, Canadian Marathoners, E. Dibaba's Stunning Marathon Debut, College XC And More We dig deep and look at Ryan Hall's performance in Chicago, his spat with Phil Hersh, give praise to Ejegayehu Dibaba for her excellent marathon debut, give some props to Reid Coolsaet, discuss a little NCAA XC and let you wish you were born in Kenya. *MB: Marya Savinova--sexiest legs on earth? Amby Burfoot Honored With George Hirsch Journalism Award Burfoot is a former Boston Marathon champ and long time RW editor. Good Read: Amby Burfoot Talks About His Writing And Running Career Times have definitely changed. "I knew a few guys who couldn't break 3:00 in the marathon and I just couldn't even imagine how anyone could possibly be that slow." LRC Hero 80-Year-Old Ed Whitlock Runs 3:15:54 Marathon His run got lost in the hoopla of 100-year-old Fauja Singh finishing in Toronto but we're more impressed with Ed. Besides, our favorite 100 (or 94) year-old marathoner was Buster Martin, who smoked and drank on the course. On The Boards: 3:15:54 for Ed Whitlock! Scotiabank Toronto Marathon Gives Koren Yal $25,000 Bonus For Tying Course Record Technically, she was due $0 since she didn't break the record, but they gave her $25k instead of $35k for the tie. Florida State Goes To #1, Washington Jumps From 24 To #2, Vanderbilt Goes From Unranked To #3 The men's side did not change as much. Disagree? LRC XC Polls Now Open Tell us who is the top in the country and each conference. NY Times Looks At The Impact The Olympic Marathon Trials Has On The NYC Marathon Field And On Marathoners' Bank Accounts Ryan Hall has some interesting comments: "It's a huge issue. It's kind of a bummer. I love the Olympics, but we take huge (financial) hits to run in the Olympics." On The Boards: Does Ryan Hall Take a Hit Running in the Olympics? We say short-term, yes; long-term, no. 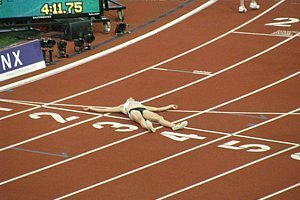 Lauren Fleshmen Tired From Marathon Training "Today's illumination is that marathon training makes me brain dead after 8pm, making it very difficult to write a meaningful blog." *Ed Moran Talks About His Upcoming Marathon Debut In New York Note to others: Training for the marathon often will do wonders for your track credentials. *Kim Smith Wins ING Hartford Half Marathon In 1:11:18 Little more than a training run for Smith, who ran 67:11. World Champs Mo Farah & Dai Greene Are Among The 87 Athletes Receiving $87,700 From British Govt. To Train For London The plastic Brit, Tiffany Porter, also is getting full funding. November's Kass Marathon In Kenya To Have Special Prize Purse For Foreigners Despite many races excluding Kenyans from prize money, this marathon in Kenya wants some good foreigners to show up. Veronica Campbell-Brown Supports Doha's Bid For The 2017 Worlds Qatar has more cash than London for athlete ambassadors, we bet. We Are "Very Supportive Of Tougher Penalties" On Drugs Cheats, Claims USOC Chief Says that the issue with LaShawn Merritt was never an attack on the IOC.